I think it's important we continue to celebrate the summer of sport, particularly the London 2012 Paralympics - and particularly so in schools where they can be used to challenge stereotypes from an early age and motivate students. 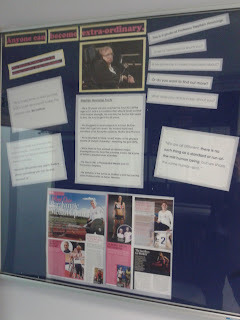 We have created a display on our main corridor to do this, using quotes from the speech delivered by Stephen Hawking at the Paralympics Opening Ceremony. I have uploaded to TES the bits and pieces I've made for displays over the past year, which can be accessed here. Below are some more inspirational quotes I've collected throughout the past week. These might be useful for assemblies or reflections during form / circle time. "If the Paralympics have accomplished anything it is confronting people with the abilities that disabled people have. It's also an indicator of progress. So many people have come here; they don't have to pay money to come and watch disabled people play sport. They are here because they want to be here, because they see it as a worthwhile event. I think that people were ready for the Paralympics,"
“I’ve already had so many messages from people saying that I’ve inspired them to get back in the pool or back on a horse and that’s just amazing. That’s always been the main goal and I’m so glad." "There might be others out there who don't reach Paralympic level but that is not the point.” "It is about giving you something. The Paralympics are giving people hope." "I think this is going to inspire disabled children and adults to get into sport,"
"In this country we will never think of sport the same way and we will never think of disability the same way,"
"The Paralympians have lifted the cloud of limitation." ”My motivation, one of my motivations, is I truly believe I was meant to do this journey,"
"I want to do my nation and my family proud." And last but not least, a fantastic Paralympics picture slideshow from BBC Magazine, with commentary from US broadcaster John Hockenberry.